Returning to Southport after a lapse of several years, the British Ring of the International Brotherhood of Magicians mounted a highly successful convention for four days, September 6-9 2018. Successful due to sterling organisation by Moira Fletcher and an incredible team of workers. Increased attendance, new members signing up and a terrific social atmosphere made this convention memorable. However, the week kicked off with a disappointment, the outside escape planned by Danny Hunt of Amethyst being cancelled (banned?) due to wet weather. From a night before ‘party’ get-together, with comedy Sword Dancing (with skilled choreography) and a singer, to the closing flash show of High Jinx with illusions and juggling, there was something for everyone. Flitting about throughout was President Richard Cadell (photo), egged on no doubt by Sooty! Principal Guest was I.B.M. International President Michael Finney, who delivered a hilarious act in the Gala Show and sound ideas and advice when lecturing. Stage shows in the spacious Floral Hall (with, it must be said, about the worst acoustics ever), featured Alexander Wells, whose one-hour show included manips of balls, wooden wand, Cups and Balls, novel Multiplying Bottles and much more; in contrast hypnotist Aaron Calvert proved the power of suggestion works, without embarrassing volunteers. Competitions for close-up and stage awards fielded seven and six performers respectively. Close-up winner was Elliott Bibby of Edinburgh with neat, entertaining card work, taking the Zina Bennett Trophy plus £500, also the ‘Rovi Trophy’ for best card effect. First place for the British Ring Trophy stage battle, plus £500, went to Megan Knowles-Bacon, combining magic and ballet in a delightful sequence. The British Ring Shield, for exceptional performance, was not awarded. Eleven lecturers were each situated in a splendid room with two large projection screens. These came from Darren Mac, Quentin Reynolds, Jon Marshall, Anthony Owen (Jeffery Atkins Memorial Lecture), Andi Gladwin, Fifth Dimension (Jeff Burns and Ivor Smith), Wayne Dobson with Richard Cadell (standing ovation), Alexander Wells, Michael Finney, Aaron Calvert with Sam Fitton, and finally Dion. There was much to learn from this assembly. More education, magical that is, came from ‘More History of Mystery’, hosted by Eddie Dawes, the speakers being Paul Freeman, Marco Pusterla, and Roy Field. Balloon enthusiasts were catered for by Graham Lee with workshops, puppets by Stuart and Libby of Safire, and juggling by Michael Jordan. In addition Professor Jon’s Flea Circus (courtesy of Jon Marshall) made two appearances, the necessary fleas all trained from scratch! The Saturday Gala Show opened with an effective Black Light sequence by Dion, leading to the production of compère Quentin Reynolds, whose stories, gags and classic Troublewit (paper folding to the uninitiated!) linked the acts well. We enjoyed two spots by Southport Dance Academy, consisting of a dozen spritely young girls. Fifth Dimension provided entertaining mentalism, and Dean Leavy, currently The Magic Circle Young Magician of the Year, proved it with varied manipulations and floating table. As previously indicated Michael Finney was a real hit. His C&R Rope with a small girl hilarious, with some of the best rehearsed adlibs ever! Magic Tango proved to be Dion from the Netherlands, with a new act based on girlfriend rejection and attempts to win her back. His lecture next day disclosing techniques and methods was quite intriguing. Michael Jordan had fun (we hope!) as he leapt, with the aid of two beefy volunteers, on to a cycle – with three vertical wheels! Comedy and skill the audience loved. Closing the show illusionists Safire, not seen for a while and a welcome return. Head slider illusion and Clear Substitution Trunk the features. Featured as ‘Stars of Close-up’ were Vanni Pulé from Malta with ‘breakfast magic’, including Egg Bag, Andi Gladwin intrigued with a notable ACAAN routine and novel Magic Square. Quentin Reynolds showed miniature Linking Rings, a couple of card items and his signature Handkerchief Mouse. Finally, Mike Sullivan played games (magically) with the word Startling and passed a borrowed ring on to a key ring, all with much humour. A round-up of film shots from past Southport conventions, by Bob and Sue Hamilton, brought nostalgic memories for many as we again saw Ali Bongo, Paul Zenon, Mike Gancia and many more in action. Unable to see everything, I missed the Ali Bongo Micro Marathon, the Sooty and Friends show in Southport Theatre, and late-night revelry at Peaky Blinders in Lord Street! At the close of the convention Richard Cadell (and Sooty!) handed the Presidential regalia to Brian Lead with best wishes for as successful a year as he had enjoyed. Next year the convention returns to Eastbourne, a popular location. Dates are September 5th to 8th 2019. 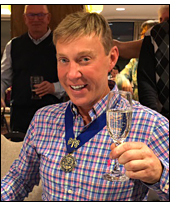 During the year President Brian Lead’s dinner will be in Blackburn, 23rd March, and Picnic, again in Leicester on 26th May. Full details of all events will appear in editions of the monthly magazine Key Ring, so ably edited by Geoffrey Newton. Not a British Ring Member? Check out the website www.britishring.org.uk for details. Join the throng, the water’s warm and friendly!